You are here: Home / Parenting / Swing Sets Are So….Typical! When Noah was born one of my biggest fears was that he would never be able to do normal-kid type stuff. 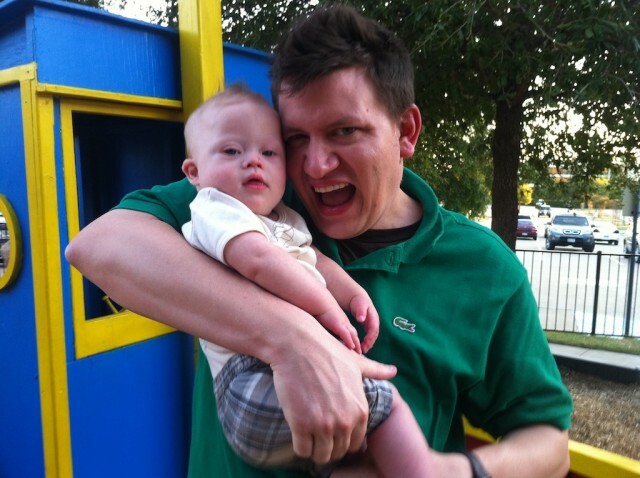 (Or as we’re supposed to say in the “world of special needs parenting…..typical children.) I remember sitting in the hospital room wondering if Noah would ever want to play with me, go to the zoo with me, spend afternoon at the playground with me, or do a million other things that typical kids do. There's nothing typical about this cute face though! 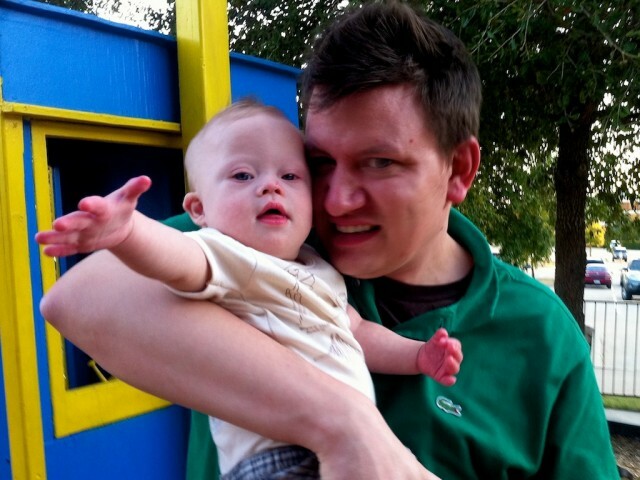 I say this all the time, but the fact that Noah has Down syndrome just fades into the background of our life. We don’t even really think about it all that much. Sure, we go to a few more therapy appointments than a typical family (what is a typical, or normal family anyway?!) Sure our son gives way better hugs than a typical child (hypotonia!). Sure, there are some unique challenges that we have (and will deal with as the come up). But our life is much more typical than I would have ever imagined it would be 9 months ago. If I only knew how 'typical' our life would be! Noah likes to do the same things as every other child I’ve ever met (regardless of a disability). And swing sets. Noah likes swing sets. A lot. Noah can't get enough of the swing! I’m having a blast watching this little boy grow up. Noah’s disability is a much less bigger deal than it was 9 months ago. We have a lot of fun in this house. And our life is much more typical than I would have ever imagined. I love my family, and the story that God is telling through it. By the way..Noah is a HUGE fan of the swing! It’s so awesome! I love watching his adorable little face light up as he goes back and forth. Being this little boy’s daddy is EPIC! Thank you swing set….for being typical. Does (or did) your little one like the swing set? How old were they when they had their first ride on a swing set? Both my kids LOVE the swing. We’ve gotten to know a lot of playgrounds in our city and probably about a 4 city radius. Alyson had her first swing ride at 8 months and wouldn’t you know it, her “typical” brother had his at 8 months too. That’s so awesome! You guys sound like fun parents. We just moved to a new house and are still trying to find out the sweet parks out! That playground was actually the one at our church. But a few months ago Noah’s grandpa came up and built Noah his own swing set! Wait until I post the videos of that! It’s so much fun watching him swing…he really likes it. Warren is crazy about the swings. If we are driving somewhere and he sees a swingset out the car window, he tries to get us to agree to go there or when we get home. We started with one of those in home baby swings, then there was the platform swing at therapy; they would prop him up on it in his bumbo chair. Even now, we live 2 blocks from a park with swings and that’s all he wants to do there. I have pictures of him swinging last year in about a foot of snow. He didn’t want to play in the snow with Mom, he just wanted to swing and he was having a blast. 1st…I like the Gravatar! Very cool! 2nd…that’s so funny about the swings….so many people say the same thing. So innocent and pure…I love it! We have a baby swing at home also…and he gets to use the ‘big one’ at therapy as well…and really likes that to! That sounds like a ton of fun. Noah liked his baby swing also! We got one of those doorway hanging jumpers on a stand like the battery operated swings and because warren is so small, he used it till he was 3. But I had one PT tell me it was awesome for him, and another told me it was the worst thing ever. Same with baby walkers. Yah…we’ve found that ot’s and pt’s have carrying opinion on lots of things…it’s easy to get overwhelmed with information. I had never heard of swings being bad for babies with or without DS, but we were also told by our PT it was better not to use a baby walker with Isabella; I believe it has to do with the baby strengthening his/her core and stability better without the use of a walker; sorry, my memory fails me sometimes. I do remember, however, our pediatrician telling us also not to use a walker with our eldest son (14 and “typical”); back then, many babies were injured or killed by using them because they did not have the safety stopping features they supposedly have now that prevents them from falling down staircases. We had a walker for our second child since we had no stairs to fear and it was quite entertaining for her, but quickly got rid of it when she figured out how to climb out of it on her own and almost tipped over. And Rick is right! We’ve also found varying opinions among OT’s, PT’s, speech therapists and even doctors on many things and have trusted a few of them and our own instincts as well. Yep Kayla loves the swing too! It’s one of her favorite things to do at the playground; and a typical classmate finally got Kayla pumping her legs at recess one day! Something I have been trying to do for a few years now! Thanks for commenting…your blog and your daughter is amazing! You guys rock! That’s so awesome that Kayla is pumping her legs……Noah’s little legs barley come out of the seat! We hope you guys had a very Merry Christmas! Aww, he is too cute. 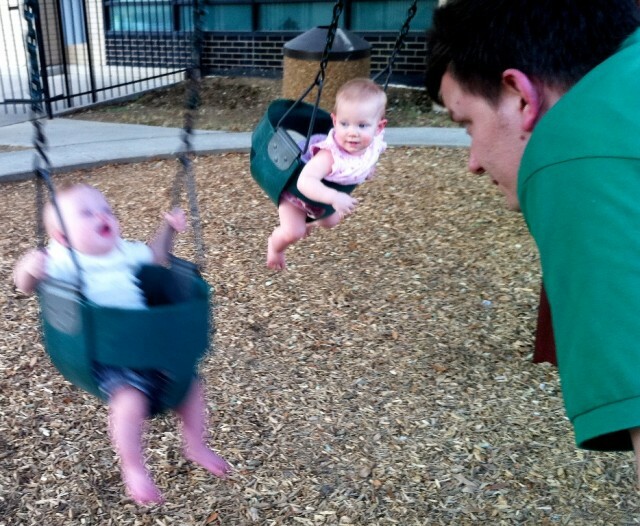 My daughter was terrified of swings as a baby, unfortunately. She likes it now that she is older, but still freaks out if we push her too high lol. I love the posts. I must say that I love to swing and so do all my kids – typical or not. Sometimes I think my daughter with DS is more normal than her siblings (or her parents)! Our kids have always loved the swing set its fun to now watch them try and pump their little legs and go higher and higher. And its nice that when they fall they “shake it off” and get back on the swing. So fun! I can’t wait for Noah to do the same. Joshua loves the swing and gives us huge smiles when he’s put in it! He had his first swing when he was about 4.5 months old, in one of those bucket type swings. Now that winter doesn’t seem to want to come to middle GA, we’re looking at going to a park tomorrow for some more play time!